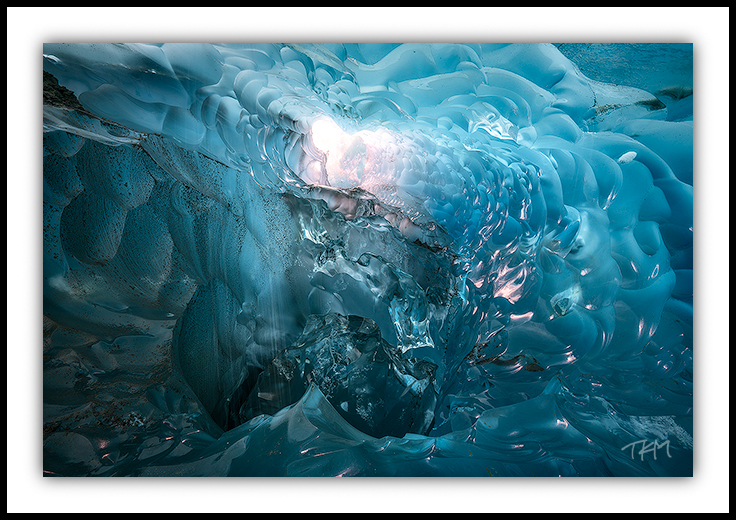 On a recent trip out to the Mendenhall Glacier with family and friends, Corey shared the glacier’s latest secret. Thinking the the best days for glacial features on the lower west edge of the Menhenhall were far behind us, I was completely taken off guard when he took a sharp turn from that path leading toward the well known subglacial cave, and we were looking into an englacial (contained within a glacier, as opposed to on top of or below it) opening with a wide floor and ceiling. I worked my way further in under the ice, and a spectacular view of mesmerizing ice shapes and light materialized ahead of me. For the next few minutes, the family outing transformed into a mandate for careful photography. Even after innumerable visit, I am continually in awe of the incomparable beauty of glaciers, God’s ever changing visual masterpieces. I originally couldn’t manage to see any depth or sense of place when I viewed the compositions I had come up with on the computer screen later in that evening. The initial disappointment spurred a return visit during which Corey climbed into portion of the cavern I was photographing in order to provide some scale that would enable viewers to judge the size of the icy surroundings. It was a valuable exercise, but it also turned out that further evaluation and careful post-processing has yielded a result I’m pleased with for the time being. After letting things settle for a while, I hope to add the photo, in a larger version, to one of the galleries on this site. In the meantime, I would certainly appreciate any feedback you have on the image. I remember in Parque nacional del Torres del Paine when a iceberg just turned showing that fantastic colors.